Design and Technology is an inspiring, rigorous and practical subject. Using creativity and imagination, students design and make products that solve real and relevant problems within a variety of contexts. Pupils at Christ’s, through the evaluation of past and present Design and Technology, develop a critical understanding of its impact on daily life and in the wider world. classroom and an adjoining specialist cutting workshop and student project space. 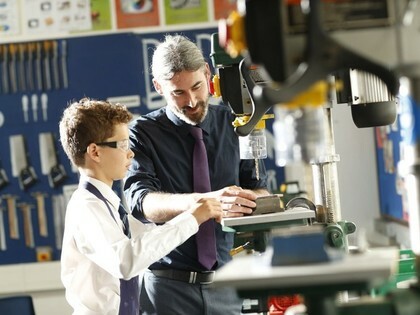 Specialist equipment such as a vacuum former and a laser cutter regularly allow pupils access to machinery that realises ambitious project goals. The Technology departments. Teaching rooms are supported by the Faculties Technicians. The Department also offers Graphics at KS3 in our specialist Art rooms and computer suites. Through a variety of creative and practical activities, pupils are taught the knowledge, understanding and skills needed to engage in an interactive process of designing and making. They work in a range of domestic and local contexts for example: the home; health; leisure, and culture, and industrial contexts for example: engineering; manufacturing; construction; food; energy; and fashion. • Become competent in a range of cooking techniques, for example: selecting and preparing ingredients; using utensils and electrical equipment; applying heat in different ways; using awareness of taste, texture and smell to decide how to season dishes and combine ingredients; adapting and using their own recipes. Pupils in years 7, 8 and 9 are taught Design Technology weekly. Assessment takes place in formal written comments lead by the department’s teachers and less formal methods of reflective feedback in class critiques and peer feedback. Questioning is a key assessment tool for the department and is fundamental to the creative progress. Learn about the main nutrients provided by the eatwell guide food groups. Health & safety in Textiles. Introduction to the sewing machine. Consolidation of Health & safety in Textiles. Development of machine and hand sewing skills. Creating a pattern from scratch. Recycling of plastics and understanding the term upcycle. Development of decoration and embellishment techniques. The department ensures exciting and creative pathways are delivered to push outcomes and that the subject specific content reflects best practice nationally. Pupils have every opportunity to work in the department outside of lessons in numerous extra-curricular activities; homework is set weekly and is practical or research based. Food Technology GCSE involves learning a range of skills, mini projects on cakes; bread; pastry and cook-chill. Researching about ingredients; authentic foods and farming in relation to the environment and traceability. Resistant Materials GCSE is broken down in Year 10 into three main projects that allow pupils to experiment with ideas while researching relevant construction processes, and material properties. In Year 11 students will produce a final product in accordance with the design briefs set by the exam board. The Textiles Art GCSE course aims to foster in students a broad understanding of the nature of Art and Design through Textiles. Students build on areas of experience covered in years 7-9 as well as learning new skills in order to present possible solutions for their ideas in increasingly independent study. The Textiles Department offers an exciting GCSE which encourages personal, imaginative and modern approaches to design. The Textiles course is a very creative course that allows students to develop a range of skills that will help them to communicate their design ideas. Students will explore different themes and learn about a wide range of creative processes and materials: drawing, painting, and photography, a variety of printmaking techniques, knitting, embroidery, computer-aided design, pattern cutting, garment construction and fashion illustration. Analysing the work of existing artists and designers and visits to galleries are an integral part of the course. The school offers RM Technology at A Level from September 2019. Christ's Art and Technology department has a proud history of involvement in local and national design competitions and awards. Students work from all stages is entered annually. Numerous opportunities are available through clubs and afterschool workshops. The department has good links with other STEM subjects in its extra-circular provision.